I was going to post about the baked beans I made yesterday – but then thought it was about time I shared some of the non-food-related creative things I have been working on. Recently I have let go of a few things in my week which has allowed me a more relaxing space to be creative at home and I have found my inspiration returning. Welcome back! This is a work in progress. It is a banner for Mikailah’s LilyWomyn journey. It is a very special piece of work and I am relishing the opportunity to flex my creative muscles, which have slackened some-what from recent lack of use. It is also quite large and I am just sinking my teeth into this project and savouring every moment I spend on it. As you can see by the progressive expansion of fleece strewn across the floor in each photo, I have completely taken over my children’s playroom, using the only table we have that is large enough to accomodate this piece of work. It is 2m wide at the moment and I am counting on it to shrink enough to be easier to hang! A lovely, peaceful, creative day. I have more work to do on the banner yet – at this stage it is ready to wet, soap and roll. Once it is felted I will work some more on it, adding more detail with a felting needle and stitching some embellishments on, as well as adding the words for the banner. 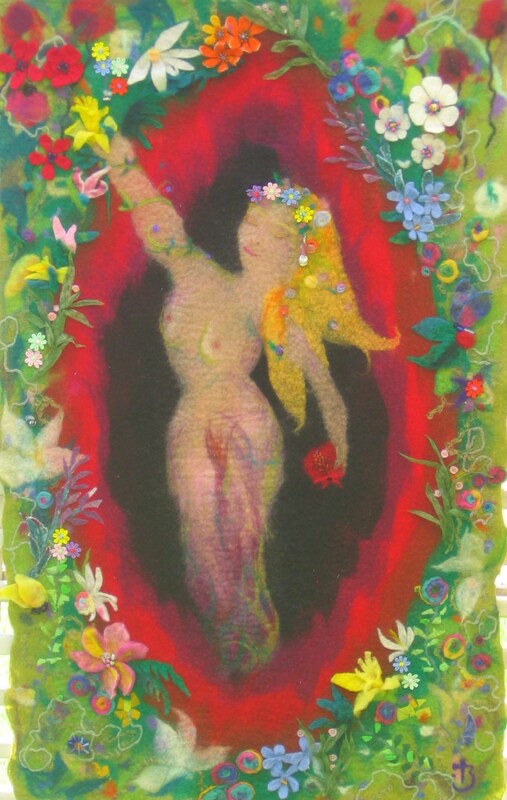 The inspiration for the flower border came from earlier work of mine, Persephone, which you can view in my gallery.